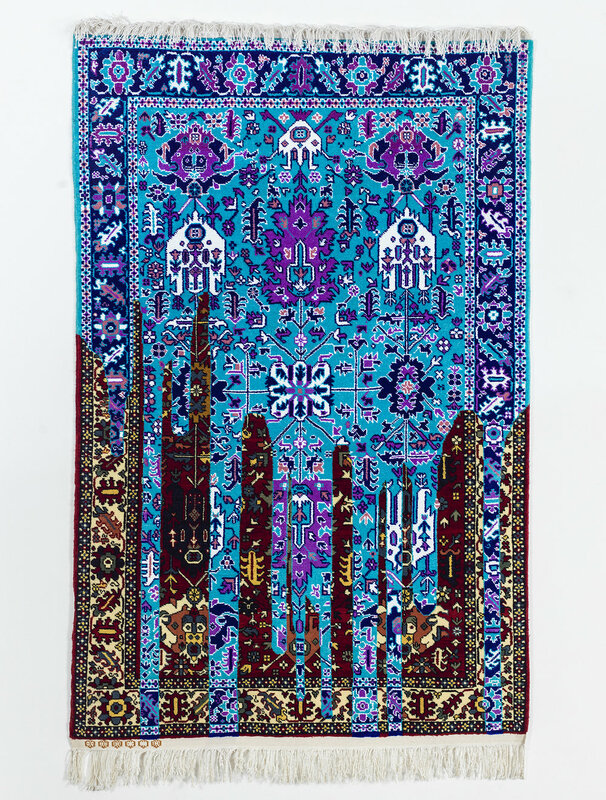 Faig Ahmed, a student of modern and ancient languages, including Sanskrit and Arabic, was interested in the origin of languages and human writing long before he became interested in carpets. It was his study of pre-historic petroglyphs that led to his fascination with the language of carpet patterns. Ahmed re-imagines carpets as a source code for visual communication, writing, design, art and even science. During the past decade, Ahmed has become internationally known for re-interpreting the coded messages in ancient carpet designs. His artwork speaks about the unconscious power of the visual language of patterns that communicates messages through generations and cultures, and links early human history with the digital age. By disrupting and re-imagining the visual code and structure of the rugs that were developed over the centuries in Caucasus, Turkey, Persia and India, Ahmed suggests new ideas about the nature of reality and the limits of human perception. Flow, change, constant transformation, disappearance and disintegration are reoccurring themes in Ahmed’s works: The visual impact of many of his works is in the tension between the stability of traditional carpet designs and the rigidity of our perception of carpets and the artists intention of capturing a fleeting, unstable phenomena. His Door series, which plays with an endless row of disappearing frames, was inspired by the Buddhist mandala practice and is an attempt to create an illusion of impermanence in textile design. His Epiphany, a carpet that is torn violently so that we see gaping holes, is a reference to a moment of insight, a sudden gap in perception. The dramatic impact of the work is that this lofty modern concept was executed on a traditional loom in a remote village outside of Baku using an age-old weaving technique. 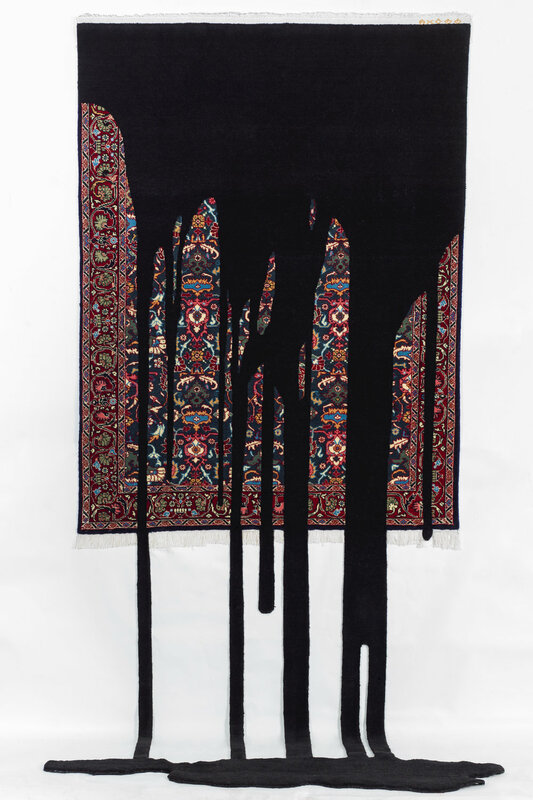 Fuel, a new work of the artist, creates the illusion of a black substance pouring over an intricate carpet, dripping down the wall and spilling into a puddle on the floor. The work references the role of the oil in the region as it is responsible for both renaissance and destruction. A strong theme in the artist’s new creations evolved from his fascination with genetic research, quantum physics and the science of small particles. Works such as Coherence, Wave Function and DNA are inspired by scientific attempts to describe metaphysical phenomena. Coherence, the largest and the only perfectly symmetrical carpet in the show, is Ahmed’s meditation on the impossibility of symmetry in nature, our perception of symmetry against a largely chaotic universe, our attempts to describe symmetry scientifically and metaphorically. The exhibit also features Ahmed’s reinterpretation of a dragon carpet from the collection of the Metropolitan Museum of Art. Ahmed is fascinated with a mystical winged and fire-breathing dragon, a design that traveled from China to the border between Asia and Europe, which runs through Ahmed’s home country,; it evolved into an abstracted pattern, almost a sign. The artist fills the carpet with red referencing the fire origin of the dragon and adds, in bold graffiti style, the words of Rumi, a 13th-century poet and Sufi mystic: “Set your life on fire.” This is one of a number of works that deal directly with language. In some cases the words continue beyond the carpet engaging the walls of the gallery. 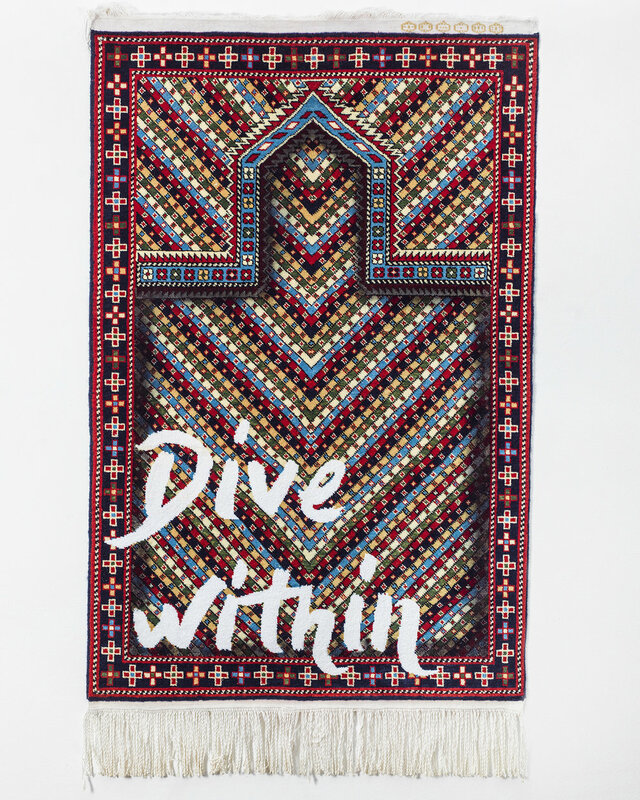 Faig Ahmed (Sumqayit, 1982) graduated from the Sculpture Department of Azerbaijan State Academy of Fine Art in 2004. He represented Azerbaijan at the nation’s inaugural pavilion at the Venice Biennale in 2007 and again in 2013. The artist was nominated for the Jameel Prize 3 at Victoria and Albert Museum. His works are in public collections including Los Angeles County Museum, Seattle Art Museum, and Palm Springs Museum of Art. This year Ahmed’s works have been featured in several important museum group shows including shows at the Museum of Fine Art Boston, Bellevue Art Museum, Museum of Contemporary Art, Cleveland, Milwaukee Institute of Art & Design, and Museum of Old and New Art, Tasmania.